The most valuable piece of real estate on Facebook will have a new look “in the coming weeks,” as the social network announced an update to its News Feed, aimed at making its presentation more consistent across desktop and mobile. 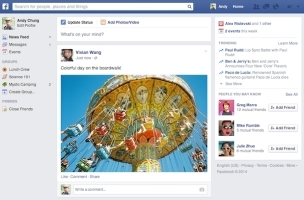 The announcement comes nearly one year to the day when Facebook introduced its last redesign of News Feed. Facebook added that its News Feed algorithm will not be affected, so users will see the same content on their News Feeds, and it also alerted brands using the social network for marketing that no changes are necessary on their parts. 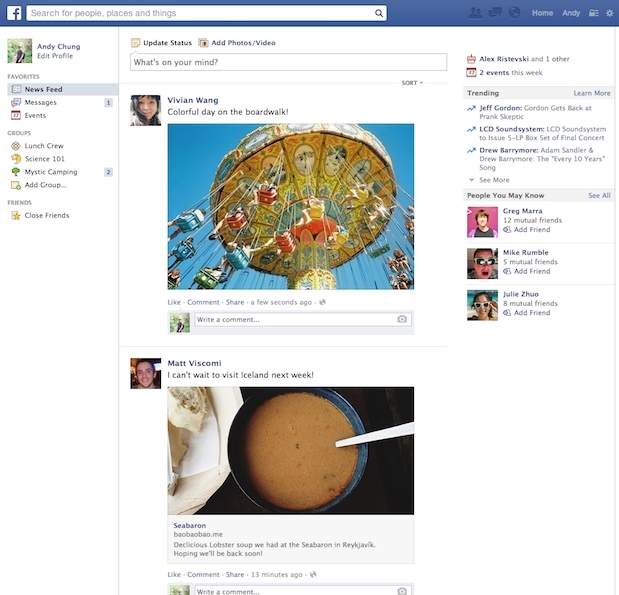 The revamped News Feed is pictured above, and the current design appears below. Today we’re rolling out an updated look for News Feed so that desktop and mobile will look the same, making Facebook more consistent and easier to use across platforms. You may recall that last year we experimented with a complete redesign of News Feed for desktop and mobile. 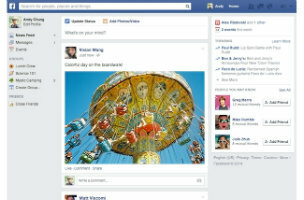 People who tested it told us that they liked the bigger photos and images, but found it more difficult to navigate Facebook overall. The updated design has the best of both worlds: It keeps the layout and navigation people liked, but offers bigger images and photos, as well as a new font. The current design on mobile remains the same. These changes are visual updates and do not affect how we surface content to people, nor do they change how stories are ranked in News Feed. Although in the new design all images are larger, both organic stories and ads will be the same size — similar to the way images appear on mobile. These changes will roll out in the coming weeks. As a marketer on Facebook, you don’t need to take any action. Requirements for creative specs and image aspect ratios for ads have not changed. Also, this update does not affect how you buy and optimize ads. You should continue to advertise based on your objectives. Readers: What do you think of the new look for News Feed?